A guy in Maine bought a pile of old stuff for $100. 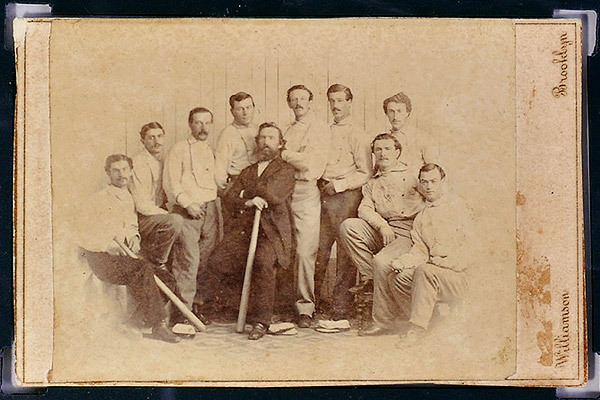 One of those items was a photo album, and inside the album he found a picture of the Brooklyn Atlantics, an early baseball team that was a powerhouse in the mid-1800s. That photo just sold for $92,000. ESPN is calling this a “baseball card.” As a former subscriber to Beckett Baseball Card Monthly and a one-time employee at a card shop, I take offense to that definition. There’s nothing wrong with that — I enjoy “Antiques Roadshow” — but a 12-year-old with a fresh pile of allowance money would not rush out to buy this thing in 1865 or 1955 or 2015. A baseball card is something that brings joy to a kid’s world. It’s shuffled and organized and collected and loved. You don’t do that with a sepia snapshot. Josh Hamilton is going to Anaheim (Yes, Anaheim. I refuse to call them the Los Angeles Angels). When he arrives he’ll get $125 million over the next five years. 1. Thank God the Red Sox didn’t do this. Thank God. 2. Is the greater Los Angeles area sitting over a massive oil field? I know there’s a lot of TV money floating around that market, but the gush of cash from the Dodgers and Angels has made the Red Sox and Yankees look like tightwads. That’s not a moon! It’s an engine for job creation! A petition to construct a Death Star has received the necessary signatures for official White House comment. As of this writing, “Secure resources and funding, and begin construction of a Death Star by 2016” has 25,956 signatures. A few weeks ago I wondered if Apple would keep the Google Maps iOS app in approval purgatory, as it had done with another Google product. People are going on about how this is a big win for Google. And it is. But it’s also a win for iOS users. Now, we have a Google Maps app that’s got the one huge thing the pre-iOS 6 version was missing: voice-guided turn-by-turn directions. So, let’s recap: Apple ditched Google Maps as the default, Tim Cook apologized, we all “suffered” with the Apple maps for a few months, then an improved Google Maps app appeared in the App Store.